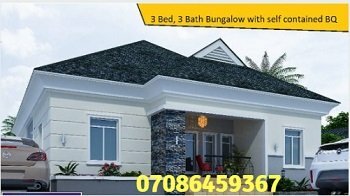 Big homes Lagos Nigeria - Big houses have a lot of space internally and externally. Unfortunately, many big homes are so big and unattractive that you wonder why the owners wasted so much money and accomplished so little. real estate consultant, I have seen lots and lots of buildings that are big and shapeless . . . Nigeria real estate without head or tail. That should not happen to you! When you decide to build your own home and you have determined that you want a spacious and luxurious big home, the very next thing is to choose a design that not only delivers on size but also on style. There are thousands of architects that have a track record for producing designs that tease the imagination. Some of these designs you will find online. Others you will find offline. the cash to buy the services of one of the best architects in the country. So, think and act smart. What are the features of big homes? As mentioned earlier, space is key. Sure, big houses with all the amenities described above is are graceful places to live. However, there is a cost attached . . . there's a price tag. Besides the size of the building construction cost, you must also think of the building maintenance cost. Nigerians often don't give careful thought to that. But you should. If after due consideration you decide that you can manage this conveniently, then go for it. Some people have the financial capability to build big homes but they opt for small houses because they decide to be quiet instead of being loud. They decide to be simple instead of being complicated. If you feel that way too, then a small house or portable fairly luxurious house is just perfect for you. Life is short. So keep things simple and enjoy it. Remember what the lord Jesus said, "If your eye is simple, your whole body will be bright". So, keep it simple and lovely.